Located in the heart of Vail Village, The Galatyn Lodge is perfectly situated for family ski trips, romantic getaways or business retreats. Convenient to ski lifts, world-class dining and shopping, and ton of winter and summer adventures, The Galatyn Lodge provides easy access to fun outdoor festivals, events, art walks and of course, world class skiing and snowboarding. Our platinum rated vacation rentals offer you the comfort of a private residence with the upscale service of a fine hotel. Exit I-70 at the Vail Exit 176. Take the Roundabout to the South Frontage Road going East. Go past the Vail Parking Structure (on your right). 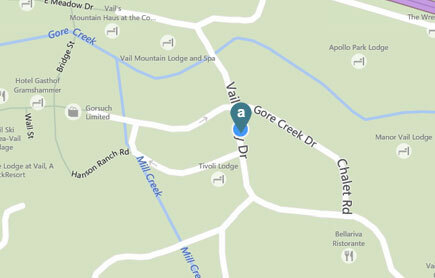 Turn right at the stop sign onto Vail Valley Drive, continue down the hill and bear left at the bottom. Cross the bridge and The Galatyn Lodge will be a block down on your right. You will be given instructions to access our complimentary onsite parking. Get personalized directions from your point of departure.